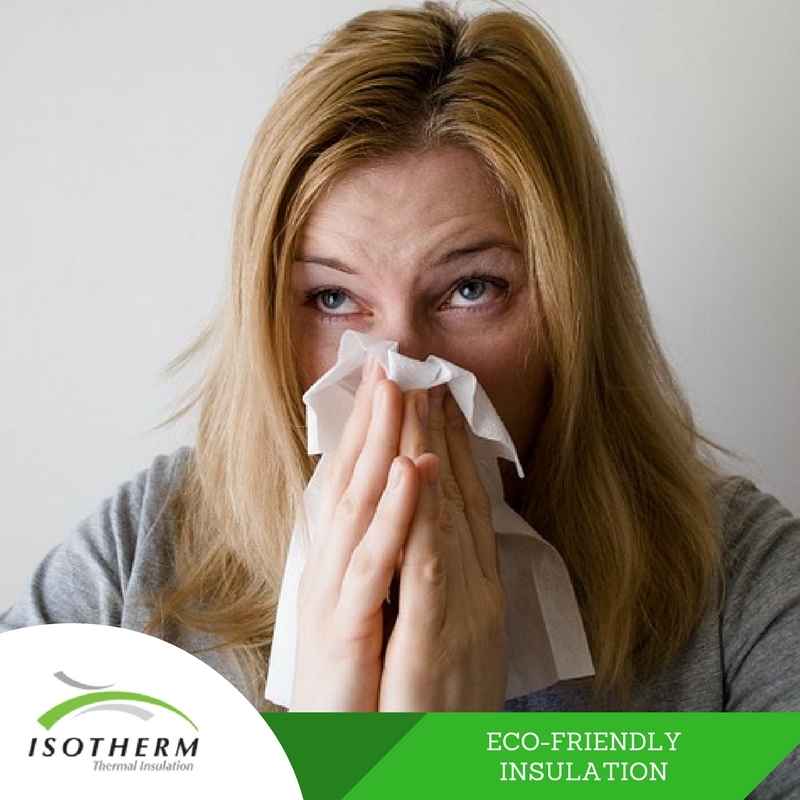 In a world where there allergies can be caused by anything from food to dust mites it shouldn’t come as a surprise that people can even be allergic to insulation. Are allergies on the rise? We are hearing more and more about gluten allergies, pet allergies, cows’ milk allergies, mould allergies, peanut allergies … and the list goes on. Latest surveys reveal that an increasing number of people suffer from allergies, not just in South Africa but across the world. Statistics show that allergies will affect 30-35% of people at some stage of their lives. Initially the increase in allergy-sufferers was noted in developed countries like USA, Europe and the UK, but nowadays more and more cases can be found in all countries undergoing industrial development. Recent studies confirm that food allergies (especially in children) have started to rise, adding to the elevated incidents of allergic rhinitis (hay fever) and asthma. An allergy is when the body identifies a normally harmless substance as a threat, and produces an inappropriate, exaggerated response to it. This reaction by a body’s immune system to substances such as food, dust mites or pollen is widespread, affecting about a quarter of the world’s population – each year the numbers increase. Researchers suggest that children from families where allergies already exist have a higher than average chance of developing allergies themselves, and to any allergy, not just the ones that their family members already have. For example, children whose parents suffer from food allergies are more likely to develop allergies but are no more likely to develop food allergies than hay fever. Our modern living conditions have contributed to the elevated allergy rate. In the past, our hygiene protocols did not include cleaners with anti-microbial agents, and our children came into contact with a variety of bacteria and micro-organisms preparing and protecting their bodies against the development of allergies. A child who has regular contact with farm animals is likely to have a lower incidence of allergies. Some people erroneously blame modern vaccinations for the rise in allergic diseases. Vaccinations eradicate virulent diseases, and are essential for the protection of the health of our children, and those vulnerable members of our society, like the elderly and newborn who cannot be vaccinated themselves and rely on a healthy community to keep them safe. Vaccinations are not responsible for the rising allergy rate. Pollutants in our environment can exacerbate existing allergies, however the question of whether pollution can cause new allergies remains controversial. You can find out everything you need to know about allergies from the Allergy Society of South Africa. ALLSA specialises in raising the standards for allergy control by advancing the knowledge and practice of allergy and immunology. They do this through publications, meetings, and conferences. The society is actively involved in fostering the education of both students and the general public. For the past twenty-seven years, ALLSA has offered a wide range of allergy-related services to anyone who needs them. They give sound medical information to aid patients, parents and healthcare providers in the management of allergic conditions. You’ll find information supplied by ALLSA in medical or health-orientated journals, magazines, radio and TV programmes. They also offer easy-to-understand information sheets on anything from food allergies, to coeliac disease, atopic eczema, rhinitis, pet allergies, latex allergies, mould allergies, house dust mite allergy, and bedding protectors. If there’s anything you want to know about allergies in South Africa, go to the Allergy Society of South Africa website. With ISOTHERM, it is comforting to know that there is a safe itch-free insulation material on the ceiling. ISOTHERM is resilient, environmentally-friendly and non-allergic. ISOTHERM Thermal Insulation is made from the thermally-bonded polyester of recycled plastic PET bottles. The plastic has been heated and bonded without any chemicals or added fire retardants. ISOTHERM falls into the flexible polyester blanket type of insulation product. Other types of insulation include cellulose loose fill, flexible fibreglass blanket, flexible ceramic fibre blanket, and rigid polystyrene. Polyester is has natural fire-retardant properties and is non-toxic. It’s the same as the polyester used in pillows and duvets. Contact us for more information on non-allergic insulation.